The North Korean leadership will come to Moscow in May for the celebration of victory in World War II, Russian Foreign Minister Sergey Lavrov has announced. If Kim Jong-un pays a visit in person, this would be his first foreign trip as head of state. Lavrov, however, didn’t specify if it was Kim Jong-un who had accepted the invitation. Earlier, South Korea's Unification Ministry explained to the Yonhap news agency that the word “leader” could also mean Kim Yong-nam, the nominal head of state. The Kremlin invited 68 world leaders to participate in Moscow’s celebrations of the 70th anniversary of victory over the Nazi Germany in World War II, Lavrov said on Tuesday. Twenty-six have already confirmed their visits. The heads of UNESCO and the Council of Europe have also said they will come to Moscow. But a number of European leaders have chosen to participate – among them Greece, Cyprus, Slovakia, the Czech Republic, Serbia, Bosnia and Herzegovina, Iceland, Macedonia, Montenegro and Norway. “The decision by German Chancellor Angela Merkel to come to Moscow will particularly help to undermine the anti-Russian campaign,” Lavrov said. “In which particular way she will participate [in celebrations] is still to be determined,” he said. Russia has also invited 16 foreign military units to take part in the May 9 Victory Parade in Moscow, Defense Minister Sergey Shoigu said. Nine of them have confirmed they will be taking part. 15,000 soldiers will march across the Red Square in 2015, Shoigu said, adding it was 50 percent increase from the previous anniversary in 2010. 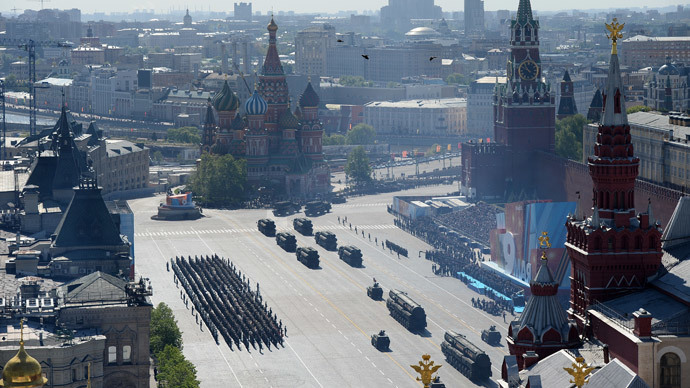 All over Russia more than 78,500 people will take part in the Victory Day parades and almost 2,000 items of military equipment will be put on display.